How Fast Can Rowing Tone Your Body? Rowing is a full-body exercise that requires you to expend a large number of calories to perform the desired motion. This makes rowing a highly effective form of exercise for helping tone and shape your body. Your body needs to get acclimated to rowing so that you can generate large amounts of force, which in turn burns a higher amount of calories. Toning improvements from rowing can generally be seen in as little as six weeks, provided you are following a balanced diet. Adjust the seat of the rowing machine so that your knees form a 90-degree angle when your feet are placed onto the foot platforms. Turn the resistance knob on the machine to set the resistance against which you will row. Lean forward at the waist and grab the rowing long bar with both hands. Push through and extend your legs while simultaneously pulling the hand bar toward your chest and leaning back. After the bar touches your chest, flex your knees, lean forward at your waist and extend your arms back to the starting position. Continue pulling and returning to the starting position in a fluid manner to increase the efficiency of your rowing motion. Rowing can burn a lot of calories. The amount of calories you burn is dependent upon your weight and the intensity at which you row. Rowing at a light intensity will cause you to expend 246 calories an hour if you weigh 155 lbs., 186 calories if you weigh 180lbs. and 326 calories if you weigh 205 lbs., according to the website NutriStrategy.com. At a moderate intensity you can expect to burn 493 calories, 572 calories and 651 calories at the respective 155 lb., 180 lb. and 205 lb. weight levels. Using a vigorous intensity level will cause you to burn 598 calories, 695 calories and 791 calories at the same respective weight levels. Pushing with the legs requires you to utilize your quadriceps, glutes and calve muscles. The lean-back motion at the waist will require you to utilize your erector spinae muscles, which run along the length of and parallel to your spine. The pulling motion requires you to utilize your lats, rhomboids, shoulders and biceps. While these are the primary muscles worked, many other muscles are responsible for stabilization and support of movement during rowing. This makes rowing one of the best exercises for targeting total muscle tissue. Row is a nonweight-bearing activity and is relatively easy on the joints when compared to exercises such as running. While you will start to see changes within six weeks as a result of training, you will notice quicker changes from the six -to 12-week and 12- to 18-week mark. At this point, neurological, muscular coordination and cardiovascular improvements will allow you to better perform rowing, which will allow you to work out more intensely and burn more calories. This will result in greater weight loss and increased muscular toning. 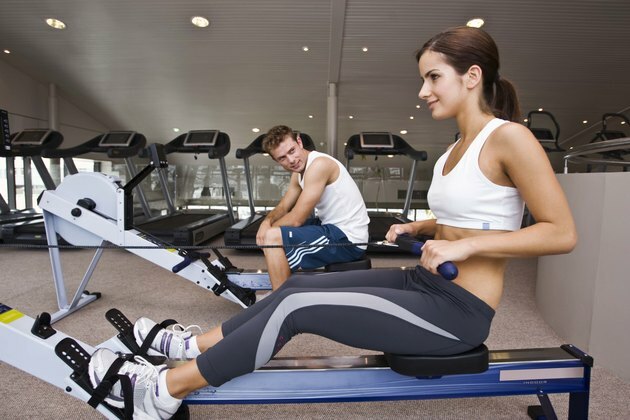 How Many Calories Can You Burn on a Rowing Machine? How Many Calories Will Sustain 161 Pounds of Weight?